Staff at the McKinley South End Academy posted signs urging a no vote on Question 2. 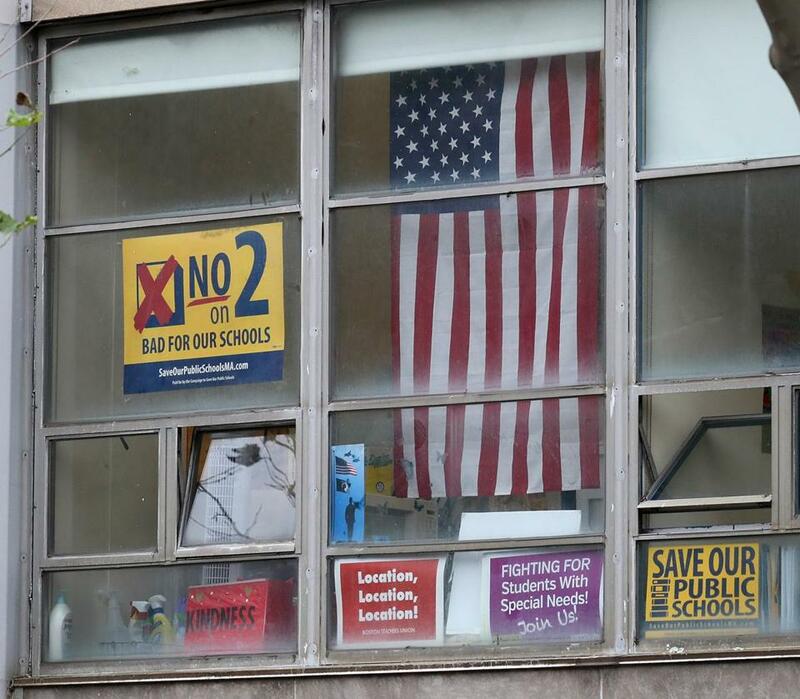 At a public school in the South End, a dozen yellow signs hang in the windows urging passersby to vote against the upcoming ballot measure that would expand the number of charter schools in Massachusetts. At a back-to-school event at an Andover middle school, a placard at the main entrance and campaign buttons worn by teachers advertised the “No on 2” message. Charter schools backers, meanwhile, have been criticized for their advocacy through school websites. The increasingly bitter fight over charter school expansion is spilling onto the campuses and Facebook pages of traditional public schools and charters alike, prompting state ethics complaints from partisans on both sides. State officials have not yet issued any public rulings on whether the activities violate the state law prohibiting the use of taxpayer-funded resources for political campaigns. But the politicking on school grounds has triggered sharp reaction from some parents and elected officials. The ruling is not expected to have any effect on a ballot question in November that seeks to accelerate the opening of charter schools across the state. Question 2, if approved by voters in November, would allow for the creation or expansion of 12 charter schools per year. Charters, which currently number 78 across Massachusetts, have more autonomy than traditional public schools and are typically not unionized. Supporters say charter schools, which are publicly funded, provide a vital choice for thousands of Massachusetts families, particularly in the poorest and most racially segregated communities. Critics say they drain hundreds of millions of dollars from the traditional public schools that serve the overwhelming majority of public school students. Thousands of traditional public school teachers, worried about those declining resources, are now knocking on doors and making phone calls opposing the ballot measure, often in coordination with teachers unions. That kind of political activity, on public employees’ own time, is legal and raises no ethical concerns. But as the campaign has edged closer to school parking lots and classrooms, it has agitated some education officials and spawned controversies. And in Milton, pro-charter businessman Dimitry Petion has filed complaints with the State Ethics Commission and Office of Campaign and Political Finance against a Pierce Middle School teacher who blasted a message to colleagues from his work e-mail account urging them to get involved in the “No on 2” campaign. “You shouldn’t be able to use resources that are being provided by the community to stage a campaign,” said Petion, who was appointed to a health care board by Governor Charlie Baker, a charter school proponent. Margaret Gibbons, president of the Milton teachers union, said there was no intent to do anything inappropriate and added that the union will “make sure nothing going forward is questionable.” But she added that the Pierce teacher is a building representative for the union and said it was her understanding union leaders can use official e-mail accounts to communicate with members about political matters. State regulators have, in fact, allowed for that sort of communication when collective bargaining agreements explicitly authorize it. The Milton teachers contract does not appear to allow such e-mails. But in Walpole, local union president Dave Cuzzi appeared to be well within his rights when he met with members recently at the town high school and discussed the ballot measure, winning approval for a resolution opposing Question 2. The Walpole teachers contract allows the union to use school buildings for meetings on the “educational process,” and state regulators give labor leaders broad latitude to speak about whatever they like in those kinds of gatherings. Cuzzi, whose union has also distributed fliers about the ballot measure outside open houses, said he understands the concern about educators using their special access to schools and parents to advocate on political issues. “I think it is a fair critique,” said Cuzzi, a sixth-grade teacher. “Parents know us. ... It’s a friendly face handing out information.” But he said the complaint from pro-charter forces “might be a little bit sour grapes.” Charter school advocates, he pointed out, have pressed their own advantages in the ballot campaign — like access to rich donors. Charter schools, meanwhile, have been pressing up against the limits of state law with online advocacy. The River Valley Charter School in Newburyport wrote a “Vote Yes on Question 2!” message on its Facebook page in August. And the Mystic Valley Regional Charter School in Malden posted a campaign-style video of Baker urging support for the ballot measure at a dramatic, rain-drenched rally outside the State House. “Watch, Like and Share this passionate appeal for a Yes vote by our governor, Charlie Baker,” the school director wrote in the Facebook post. Jason Tait, a spokesman for the Office of Campaign and Political Finance, said a school website or Facebook page should not include “any overt, express advocacy” for a political cause. But defining “overt” can be tricky. And more broadly, Tait acknowledged, “there are a lot of gray areas” in the law surrounding the use of public resources in political campaigns. Is a “vote no” advocacy table at a school event forbidden if the principal says he would have allowed proponents to set up shop, too? Beyond the legal questions, there are basic questions about what’s appropriate in an educational setting — questions that ultimately fall to teachers, principals, and administrators. Sheldon Berman, the Andover superintendent, said that when it comes to managing political debate in and around schools, a hands-off approach is often best. “I can’t give or deny permission” for legal activity like holding signs outside an open house, he said. “I’ve never found it to be effective.” A heavy hand, he suggested, often just alienates everyone involved.